While tooth decay seems to get most of the “media attention,” there’s another oral infection just as common and destructive: periodontal (gum) disease. In fact, nearly half of adults over 30 have some form of it. And like tooth decay, it begins with bacteria: while most are benign or even beneficial, a few strains of these micro-organisms can cause gum disease. They thrive and multiply in a thin, sticky film of food particles on tooth surfaces called plaque. Though not always apparent early on, you may notice symptoms like swollen, reddened or bleeding gums. The real threat, though, is that untreated gum disease will advance deeper below the gum line, infecting the connective gum tissues, tooth roots and supporting bone. If it’s not stopped, affected teeth can lose support from these structures and become loose or out of position. Ultimately, you could lose them. We can stop this disease by removing accumulated plaque and calculus (calcified plaque, also known as tartar) from the teeth, which continues to feed the infection. To reach plaque deposits deep below the gum line, we may need to surgically access them through the gums. Even without surgery, it may still take several cleaning sessions to remove all of the plaque and calculus found. These treatments are effective for stopping gum disease and allowing the gums to heal. 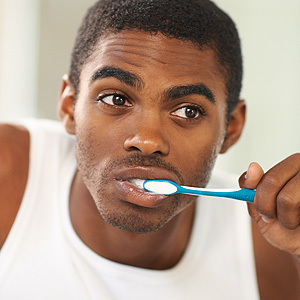 But there’s a better way: preventing gum disease before it begins through daily oral hygiene. In most cases, plaque builds up due to a lack of brushing and flossing. It takes only a few days without practicing these important hygiene tasks for early gingivitis to set in. You should also visit the dentist at least twice a year for professional cleanings and checkups. A dental cleaning removes plaque and calculus from difficult to reach places. Your dentist also uses the visit to evaluate how well you’re doing with your hygiene efforts, and offer advice on how you can improve. Like tooth decay, gum disease can rob you of your dental health. But it can be stopped—both you and your dentist can keep this infection from ruining your smile. If you would like more information on preventing and treating gum disease, please contact us or schedule an appointment for a consultation.